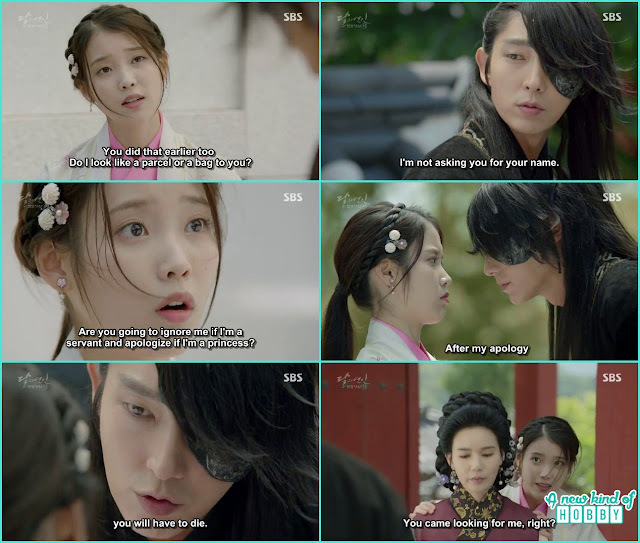 Episode 1 being the introductory left a lot of curiosity as it ends with the horse riding scene of Lee Joon Gi & IU. All we were curious to knew why the 4th prince Wong Wok saved Hae So from drowning and grab her hand over the horse he was riding. Seeing his nasty nature we couldn't digest this scene. So ended with all the fantasy after a few seconds. Wong Wo threw away Hae So from the horse, he sure has his temper while no body could understand. Also we wonder Hae So didn't broke her neck as she was unexpectedly thrown while riding the horse. She couldn't do anything and scream cal l the police we laugh that she forgot that she is in Goryeo Dynasty. A Passer by lady told her that don't you know he is the 4th prince. So she ended up cursing him. 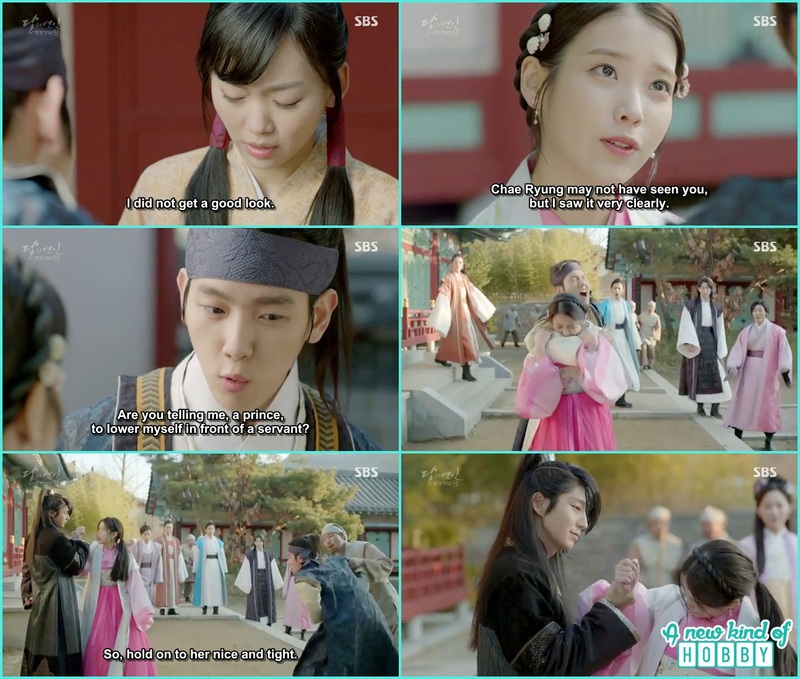 Another scene where Hae Soo make a fuss not knowing that he is the youngest Prince Wang Eun. She caught her peeking in the maids room through a hole. She scold him for doing such an act. Her behavior made her more prominent that she never fears and stand for unjust. 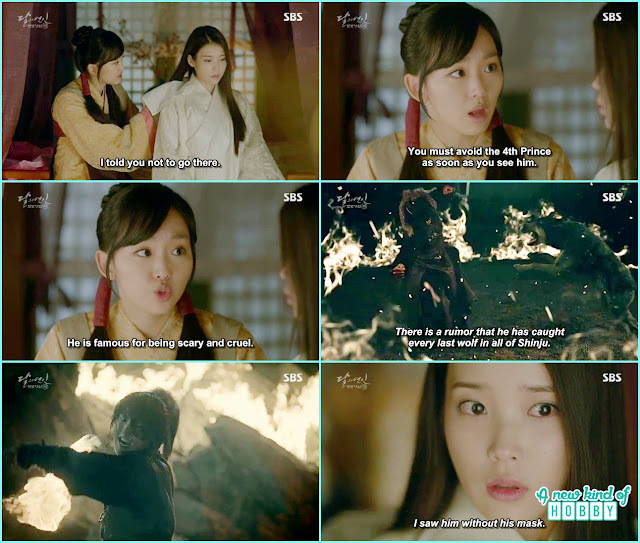 Hae Soo ended up being in fight with Wong Eun the youngest Prince. It was a very funny scene. The prince gather to see their fight no body took a step and make then stop. 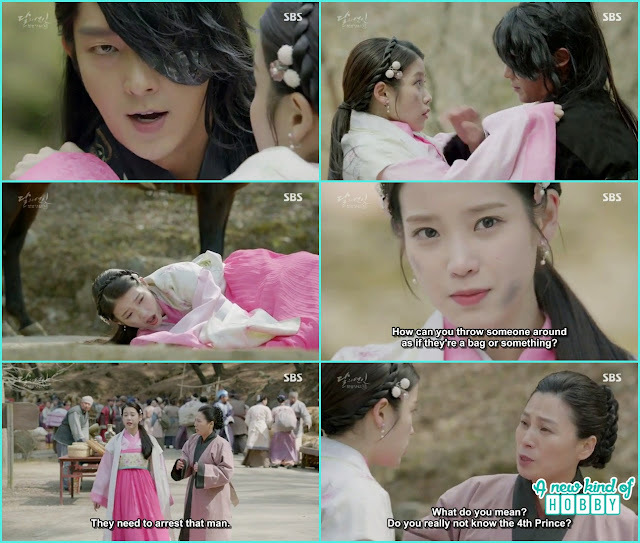 She didn't hold back and bite his hand it was the 4th prince Wong Woo who interrupted her fight. Hae Soo argument didn't end, now it was the 4th prince Wong Wo who become shocked to see Hae Soo boldness. No body had ever talk back to him and even ask him for apology. Bt it was Hae Soo she can't stay quiet and again created another fuss over apology from Wong Wo who threw her from the horse after saving her. We never expect Wong Wo's answer but was really amazed and scared when he replied, "You have to die after receiving my apology" OMG so scary. It seems all his emotions and humanity had dead some where and he didn't even care for others. 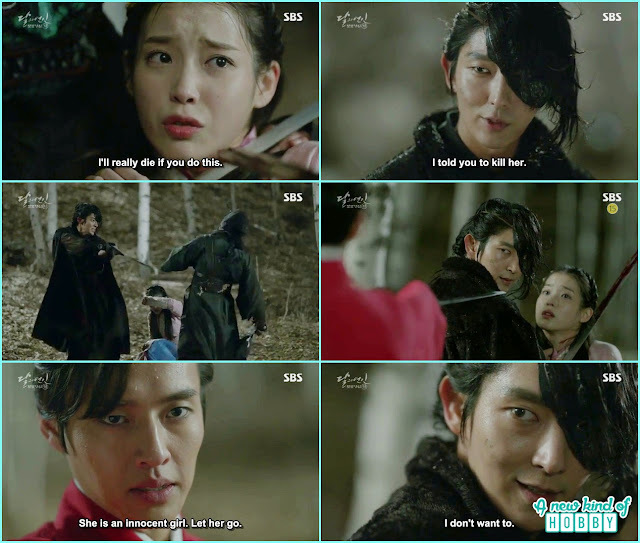 The story somehow getting more and more interesting when ever Hae So encounter the 4th Prince Wong Woo and Hae So start argument but Wong Wo end saying "i Will kill you", "don't appear infront of me", "forget what you saw". It was another romantic scene at Prince bath house we really enjoyed and scared as well. Hae So wanted to go back to her world so she thought it might be a help to find a way at where she appeared. She came to the bath house and encountered Wong Wo who was about to take a bath. It was the beautiful scene if we just watched it muted but actually they argued and Hae Soo happen to see Prince Wong Woo face with the scar. This made Wong Wo worried and annoyed and he walked out saying "forget all about what you saw, other wise i'll kill you". After he left Hae So found a hairpin dropped from Wong So clothes and picked thinking she will give it back to him. We feel pity for him as he had too wear the mast to hide his scars and always remain in anger just to hide his lonliness. Finally it revealed why the forth prince always wears a mask. This mask remind us of many dramas like city hunter, iljaime, Love in the Moonlight, Bridal Mask and etc. Hae So's maid told her many details about the palace and the 4th prince. It was the shocking revelation. We come to knew about 4th prince life. The maid also warn Hae So not to bum in the 4th prince ever again. If it happen so her life might be in danger all she had to do is to avoid him. Then Hae So told the maid she saw the 4th prince with out the mask. Queen Yoo was setting up a conspiracy to kill the crown Prince Wang Moo and wanted to make one of her son to become the Crown Prince. On the other hand the Prince were preparing for the performance for the event. It was a very unique performance we had ever seen. But something seems wrong form the starting as there were politics and conspiracy plotted a head before. The performance got ruined some people wearing mask interrupted and attack the prince. It was a hovac but luckily the 4th prince Wong Wo fight with them and made them leave the spot. Hae So was out with the maid and was enjoying the lantern festival and happen to see the 4th Prince riding the horse she came to give the hairpin and ended up being a hostage. It was the fight between Assassins and 4th prince. Wang Wook saved Hae So by killing the assassin and receive a scolding from 4th Prince that he didn't able to knew who sent them and what was their motive. They will need to find who are behind the Crown Prince's attempted assassinations. Hae Soo was so scared now she was being hostage by the 4th Prince. Wong Woo was scared of the 4th Prince that he might not hurt Hae So he request him to leave hae so she is all innocent she has nothing to do with anyone but 4th prince refused "i don't want to", that was his temper he always do what he want to he never listen and compromise with others. The episode ends here. It was another interesting episode with many sweet and bitter encounters of Hae Soo with the 4th Prince. The 1st horse scene remind us of Arang & The magistatrate and Illjaemi. But to think of this story it might be more beautiful and attractive if the director add some sweet and smiley glare instead of a blank one. Also we wonder why doesn't she hurt her neck when the 4th prince threw her off from the horse. The fight of Hae Soo with the youngest Prince was hilarious. We never like the political and conspiracy plots, but the fight of Lee Joon Gi their lantern festival performance we enjoyed. We also understand the 8th Prince act he is just being cheating on his wife over Hae So. But his wife never even points a single she notice and just fulfil her household duties. Poor Myung Hee. Every body was worried about the crown Prince but he wasn't the one who hurt it was the 4th Prince who hurt badly while saving him and no body cared and criticized that may be its his plan to ruin it. Seriously it was a complicated Royal Family, the King married several times and had lot of Flower Boy Prince. The queen always busy plotting the conspiracy. We feel pity for the 4th Prince and was all curious how can a mother make his son face like that and even send him to Shinju household where he suffered a lot and become like this. He need so much care and attention as he was the most lonely among all the prince. He also bought a gift for the queen but couldn't gather the courage to give it to her. That gift ended up in Hae So hands. We catchup on all Kdrama & Movies. A blog where we share our experience and rambling thoughts.